Tozoa™ :: Do what? :: Jon: Brain surgeon/rock-star/world dictator. In this thread, you can basicly ask me anything about The ComicTM. Or anything else, for that matter. Finally! The World is Mine! *Sniff* ...what now? This game is freaking hard.. Play it! Jon wrote: This game is freaking hard.. Play it! I HAVE MY OWN EMOTE?!!?!? So a again,hereyou can basicly ask me anything about The ComicTM. Or anything else, for that matter. 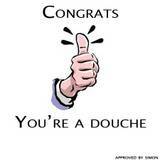 jon am i a douche nozzle? but2face wrote: jon am i a douche nozzle? you are an Retard! i Hope you get banned!